In order to execute a successful product launch, it is imperative for medical affairs teams to construct pre-launch timeline processes and procedures that are strategically thought out and continually support products in development. Pharmaceutical and biotechnology communities are challenged by a multitude of factors such as a limited timeframes for market exclusivity, changing environments within healthcare coverage communities, and dynamic compliance regulations for commercial and research and development teams. To meet product launch expectations, medical affairs professionals must work to best execute a timeline of pre-launch activities that support a successful launch, which includes building product disease awareness, generating interest within payers through the use of real world evidence to promote patient access, and development of relationships with key opinion leaders (KOL) to ensure product success. 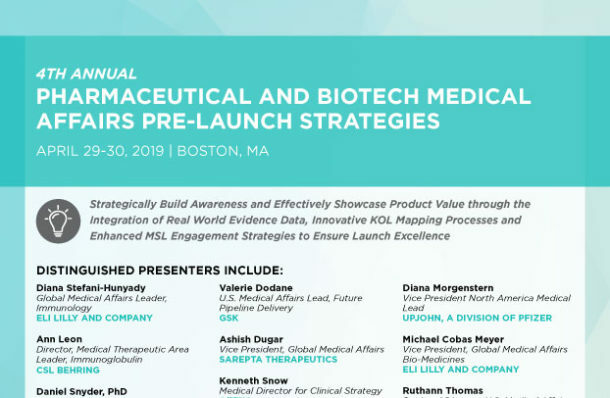 The Q1 4th Annual Pharmaceutical & Biotech Medical Affairs Pre-Launch Strategies Conference will continue upon several years of meaningful professional industry education, and allow executives to hear practical insight on launch timelines, programs, and strategies from organizations that have effectively navigated previous product launches. High level panel discussions, in-depth case studies, and workshops allowing for attendee engagement and knowledge share will make up the core structure of this meeting, while external stakeholders including private payers, healthcare providers and advocacy groups will complement the educational objectives, ensuring all stakeholder voices are integrated. We hope to see you at the conference!